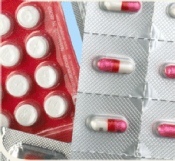 A new line of custom Table Top blister sealers for sealing capsules and tablets in blister packs, also thermoform trays.. 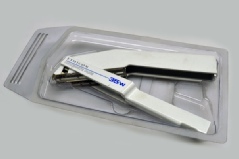 These Table Top Blister Sealers can be easily adapted to your specific heat sealing requirements. There is a standard 8 x 12 inch and custom blister heat sealer platen sizes that you can choose from. The table top blister sealer has safety features build in such as low pressure safety descent with high pressure heat seal. Contact us for quotes. Table top tray heat sealer that is designed for low to medium production requirements, where space and size are considerations. This unit is a single sided shuttle type sealer which utilizes quick-change seal tools for sealing medical blisters or trays with Tyvek, foil, or medical paper lids. Validation ready, this precision machine is clean room ready for any production operation. 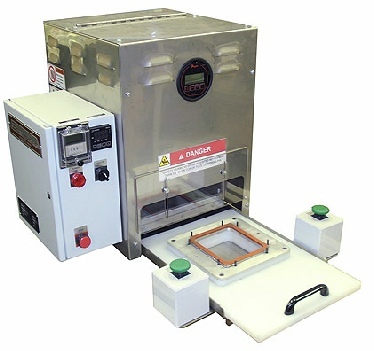 a “clean room” table top heat sealer.